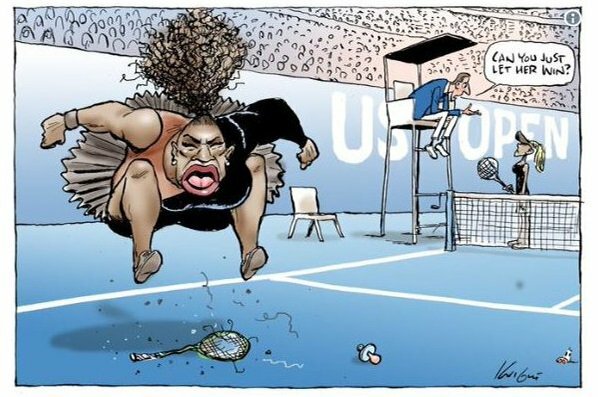 Do you think this is a racist cartoon drawing of Serena Williams.. If no,then why not,,if yes,then why so..>>>>>>>><<<<<<<<.. I see a typical "caricature" drawing representative of a grown woman throwing a temper tantrum like a three-year-old. This drawing is accurate IMO. Caricatures are generally unflattering. She did have a temper tantrum. Several tennis players have chimed in about 'this incident' including John McEnroe, the king of tantrums, along with Martina Navratilova, Chris Everett and several other professional players. There is a WHOLE lot more to this than just a temper tantrum. Were any of you watching the match? I was and I'm torn about both the decision and the cartoon. "I'm torn about both the decision (by the umpire) and the cartoon". Not a word uttered by me about stats or who was the best player. There WERE some words from other tennis players who know lots more about tennis and penalty calls than I do. ....was her opponent blonde ? Why not Benny..>>>>>>>><<<<<<<..No she was not blonde.. This may help clear a few things up Benny..>>>>>>>><<<<<<<<.. The Japanese girl had blonde streaks Ben..>>>>>>>><<<<<<<<.. The racism comes from the fact that she is black Benny..the tantrum was not racism,the blonde japanese was not racism,if they drew a picture of McEnroe like that when he had a tantrum it would not have been racism..so the only thing that stands out different is serena is black...Who knew..and yes Benny the japanese girl outplayed serena in all the stats..>>>>>>>><<<<<<<<..
She's a big boned very muscular woman. My ex- would say, she's a Brick House. I see it as a caricature, which tend to be unflattering. Seeing the photo added to Julie's answer clarifies the clothing in the cartoon. If you want to see racism, by golly, you'll see it. I don't. Your on the money Bob..>>>>>>>><<<<<<<<..
No , she's just someone who's used to being the centre of attention having a tantrum. I don't see how it's racist, but I don't know why they had to make her look so fat. She aint fat MCM,,she just A BIG WOMAN..>>>>>>>><<<<<<<<..
Dundee knows how to figure out the men from the girls,he has a proven technique..>>>>>>>><<<<<<<<.. I was thinking about posting that "technique", but I was afraid it would be deleted! Your smarter than the average bear Clonge..>>>>>>>><<<<<<<<..
No. I do not think it was racist. But the words about her being upset because she lost seems ridiculous. I think she was upset because of differential treatment. Wanting to penalize her for something that they don't penalize men for. But often that is the name of the game. Let me know if you think she was treated equal with men..>>>>>>>><<<<<<<<..